It's one step closer to autonomous driving. We’re at Auto Shanghai 2017 and the flagship sedan lineup has just had its official debut to a surprising amount of pomp and ceremony, with a cool light show and full orchestra (the wagyu beef and champagne are a particularly nice touch). Set to arrive in the US in about six months’ time, there are a total of six trim levels, all of which receive new headlights and taillights, front and rear bumpers, and a restyled grille. Perhaps the most important thing you need to know about the updated S-Class is that it features the automaker’s latest Intelligent Drive suite of active safety and driver tech, bringing the vehicle even closer to autonomous driving. These advanced features include Active Distance Assist Distronic and Active Steering Assist, which are now even more useful to the driver. For example, speed is now automatically adjusted ahead of curves or junctions. There’s also something called Energizing Comfort, an extra feature that combines various comfort systems within the vehicle, such as ambient lighting, climate control, and a massage function, enabling owners to configure a specific setup to their current needs or mood. Cool. There’s a total of Six Energizing Comfort programs: Freshness, Warmth, Vitality, Joy, Comfort and Training. Each program runs for 10 minutes, and are visualized on the head unit with color graphics, and backed up with suitable music. In fact, five songs are already stored in the program. The breakdown of the updated S-Class lineup is as follows: S450, S450 4Matic, S560, S560 4Matic, S560 and S650 Maybach Sedans, and, of course, the AMG S63 and AMG S65. The base engine is a 3.0-liter biturbo V6 with 362 hp and 369 lb-ft of torque. The S560 features a 4.0-liter twin-turbo V8 that’s good for 463 hp and 516 lb-ft, and both of these engines are paired to a new nine-speed automatic. Rear drive is standard and all-wheel drive (4Matic in Mercedes-speak) is optional. 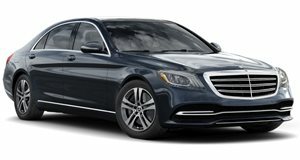 The Maybach S650 (featuring a 7.9-inch longer wheelbase) is powered by a 6.0-liter twin-turbo V12 with 523 hp and 612 lb-ft, and mated to a seven-speed auto. As for the AMG models, two flavors are offered: a 4.0-liter twin-turbo V8 with 603 hp and 664 lb-ft, and the 6.0-liter twin-turbo V12 with an insane 621 hp and 738 lb-ft. The Maybach trims come with a host of uber luxury goodies, like a pair of folding rear tables, rear refrigerator box, panorama roof with Magic Sky Control, and a Splitview front-seat entertainment system. Heck, there’s even silver handcrafted champagne flutes by Robbe and Berking. All new S-Class trims come with a new three-spoke steering wheel and the latest version of the automaker’s COMAND multimedia system, as well as a set of 12.3-inch high-resolution display screens, situated in a shared glass panel. Nothing but high quality materials were chosen for the interior, such as open-pore woods and leather-trimmed doors and upper body edges. Once again, the interior comes with energy-saving LED technology, and optional extended ambient lighting in 64 colors. Official pricing, which will start close to six-figures, will be announced closer to the on-sale date later this year. Узнайте про важный веб портал на тематику zaraz.org.ua.